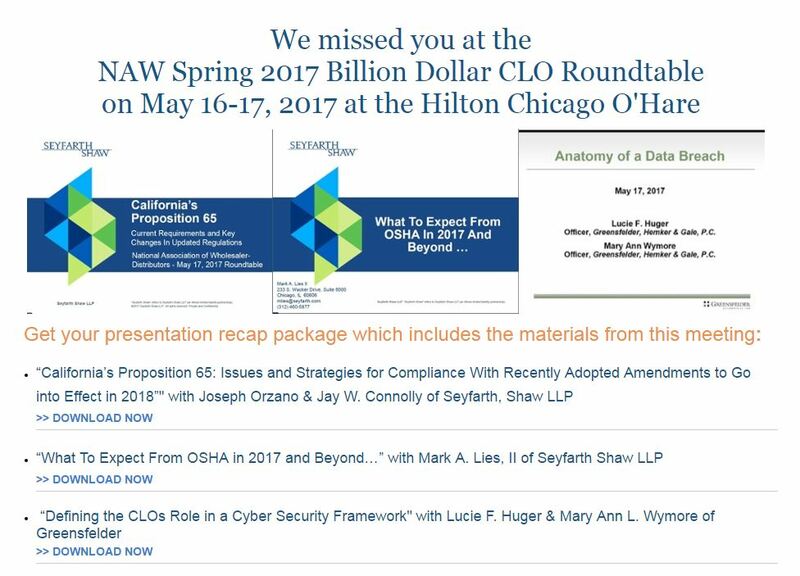 We missed you at the NAW Spring 2017 Billion Dollar CLO Roundtable on May 16-17, 2017 at the Hilton Chicago O'Hare. Download the content that was shared at the Spring 2017 CLO Roundtable with this exclusive community of Billion Dollar Distributors. Why attend a NAW Roundtable? NAW Roundtables are an exclusive community of the top executives wholesale-distribution. The Roundtable format provides a diverse community of non-competing executives in a safe environment to idea share and benchmark. Roundtable attendees receive CEU credit hour certificates after each event towards industry certifications. Roundtable Members have access to engage with the community in between events to survey, benchmark or share advice. NAW’s unique and exclusive NAW Billion Dollar & Large Company Roundtables provide distribution’s top leaders with intelligence and takeaways unique to any other industry event.